Metric: Guards. They may or may not have an outrageous French accent but they might have a grail, which is nice. Just don't draw their attention or they'll taunt you. 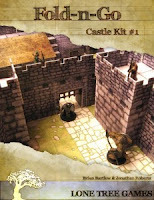 DISCLAIMER: This review based on a copy provided by Lone Tree Games. Overall: 5 guards. Classy stuff, Castle Oooh! rather than Castle Argh! This modular kit becomes greater than the sum of it's parts when fully assembled. A lot of the modules don't require glue, but where needed a little glue and finesse goes a long way. Photo tutorials help to master this kit. Assembly is intuitive with great results. Brian Bartlow and Jonathan Roberts have made something well worth your time here and the re-usability of the component modules makes it an excellent choice. Contents: 5 guards. Lots of reusable bang for your buck. Towers of varying heights, two houses (one storage, one bunkhouse), parapets, wall sections, gatehouse, keep and portcullis. The signal mound even has wood to ignite! The utility of each section as a stand alone component ensures you have plenty of vignettes for a fantasy game or even more contemporary pieces depending on selection. Assembled they make an excellent border castle and the kind of place adventurers and soldiers hang out. Functional fantasy rather than fairytale, excellent nevertheless. Artwork/Layout: 5 guards. Excellent detail and helpful pictorials go a long way. This is where the meat of the product lies. The attention to detail is excellent. From shutters on bunkhouse windows to wood on the signalling mound. The little touches make a difference. The detail doesn't limit it's utility either - unlike some floorplans I've used before. In the PDF there's plenty of pictorials showing how to assemble the sections. Some glue and manual dexterity is required. That said, there's a lot of quick wins here for a beginner. The experienced modeller will get plenty of hacking utility out of this possibly building massive fortresses from the templates here. Prior to review, Steven Russell said this would be something special. That's a modest assessment. This is something a modelling klutz like me can manage to build something classy out of. Individual modules are eminently re-useable. If you play a game where maps and positioning are significant, get this. You will be pleased with the result. Those of you with a copy of Kobold Quarterly 18 who want to run the Who Watches the Watch Fires? scenario have the perfect model with this castle. Additional support is available via the Lone Tree Games website. I don't usually use anything but the most rudimentary of maps (and sometimes not that) but this is cool and very tempting.